Last year I had the opportunity to be keynote for the Awards Banquet and Induction Ceremony segment of the 6th Annual International Colloquium on Black Males in Education 2017 held in Toronto, Ontario. 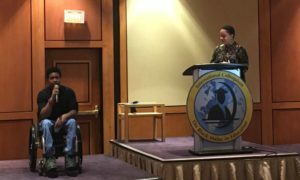 When I thought about what remarks I could offer this audience of Black American and Canadian men and women, I couldn’t help but think about my son and his experiences in post secondary, especially after a drunk driver hit him, which left him paralyzed from the waist down. Maybe I could offer my experience as a mom of a Black son with a disability. In the end, we decided to do the keynote together and share our transformational experiences, from the perspective of a mom and a son.